According to data from the Cigar Association of America, 362 million handmade cigars were imported into the United States in 2018, the most since 1997. 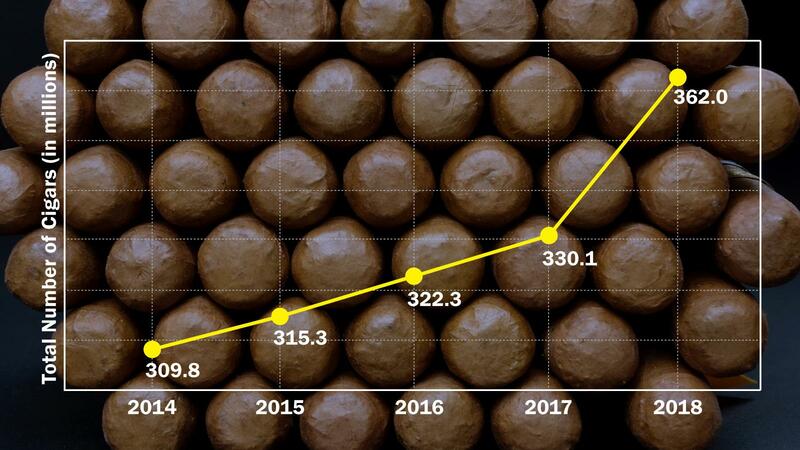 The engine powering this growth is Nicaragua, which shipped 172.7 million premium cigars to the U.S. in 2018, up 16 percent from the 148.3 million shipped in 2017. Shipments from the Dominican Republic, the second-largest producer, were essentially unchanged from 2017 to 2018, with 118.2 million cigars shipped to the United States. Honduras, the No. 3 exporter, saw a modest rise to 69.7 million cigars. It’s hard to overemphasize the growth in the Nicaraguan cigar industry over the past 20 years. In 1998, Nicaragua shipped only 24 million premium cigars to the United States and ranked third as a producer behind Honduras (82.6 million cigars shipped in 2008) and the Dominican Republic, which sat in first place at the time, with 184.8 million shipments. Nicaragua was nearly tied with No. 4 producer Jamaica, and a little more than twice the size of No. 5 producer Mexico. Nicaragua’s cigar industry has grown more than seven-fold in 20 years. Today, it’s home to such storied cigar brands as Padrón, Oliva and My Father, many of the Rocky Patel lines and nearly all of the cigars produced under the Tatuaje brand name. Seven of the 15 cigars named Cigar of the Year by Cigar Aficionado have been made in Nicaragua, more than any other country. Looking back, premium cigar imports were stagnant in the 1980s and early-1990s, picking up steam in late-1992 and surging at unprecedented levels. Shipments rose from roughly 100 million units in 1992 to 417.8 million in 1997, before slowing to 334.6 in 1998 and 248.3 million in 1999. Shipments grew slowly (in most years) in the first decade of the 2000s, but it took until 2012 before they reached 300 million units again.